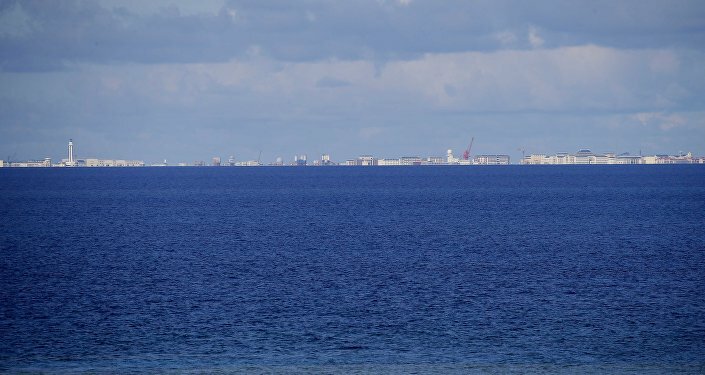 For the remainder of the month, and going into January 2019, the size of the Chinese fleet, composed of vessels with the People's Liberation Army-Navy, China's Coast Guard and various fishing ships, fluctuated as they stationed themselves near the contested island as construction commenced. "The fishing boats have mostly been anchored between 2 and 5.5 nautical miles west of Thitu, while the naval and coast guard ships operate slightly farther away to the south and west," the report explains. "This deployment is consistent with prior examples of China's ‘cabbage strategy,' which employs concentric layers of fishing, law enforcement and naval vessels around contested areas." 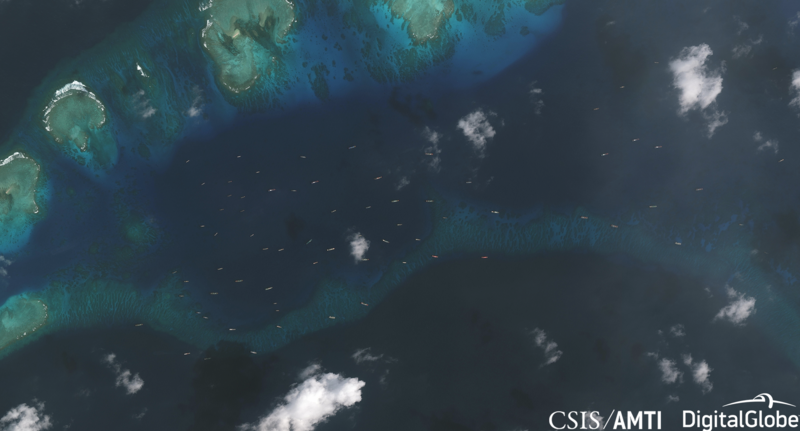 On December 20, 2018, satellite imagery showed 95 Chinese vessels near the island, before many were recalled, leaving the overall tally at 42 ships by January 26, 2019. Two of the vessels spotted during December 20 observations were identified by AMTI as a PLAN Type 053H1G frigate and a CCG Type 818 cutter. "The drop in the number of government vessels, mirroring the reduction of the militia presence, suggests Chinese forces have settled into a pattern of monitoring and intimidation after their initial large deployment failed to convince Manila to halt construction," the report concluded. According to the Philippine Star, "Chinese coast guard vessels and militia fishing boats" have also been spotted near Sandy Cay, a shoal located some 2.5 nautical miles from Thitu Island. Also known as Pag-asa Island, it is claimed by the Philippines, China, Taiwan and Vietnam and is the second largest of the Spratly Islands. The Philippine government's plan to build a beaching ramp on Thitu to allow Filipino ships to better transport repair materials and to lengthen the island's runway to accommodate larger planes was initially announced in April 2017. Earlier this week, the AMTI report was criticized by Philippine Defense Secretary Delfin Lorenzana over its claims that ongoing construction efforts would also include land reclamation, the Manila Bulletin reported. "As of now, only the beaching ramp is being undertaken. Next is the concreting of the runway. The third phase is the lengthening of the runway, which will entail the reclamation of about 300 meters," Lorenzana explained to reporters on Thursday. "Reclamation means there is land before, and you are reclaiming the land back. Since there is no land, but the water, we call it filling up the space with stones, gravel and soil." Lorenzana issued a statement on the presence of Chinese vessels on Friday, stressing that building efforts would continue and that other claimants in the disputed water should "respect Philippine sovereignty" and behave in a "civilized manner befitting members of the global community." "Having undergone careful planning and consideration, with full respect to international law and rules-based order governing civilized states, implementing these improvements is a legitimate undertaking and well within our rights as a sovereign nation," Lorenzana said in the statement. The Philippine Star reported that aside from the focus on the runway, the government will also be working on constructing better barracks for soldiers, sewage disposal systems, storage facilities for fishermen and lighthouses, among other projects.